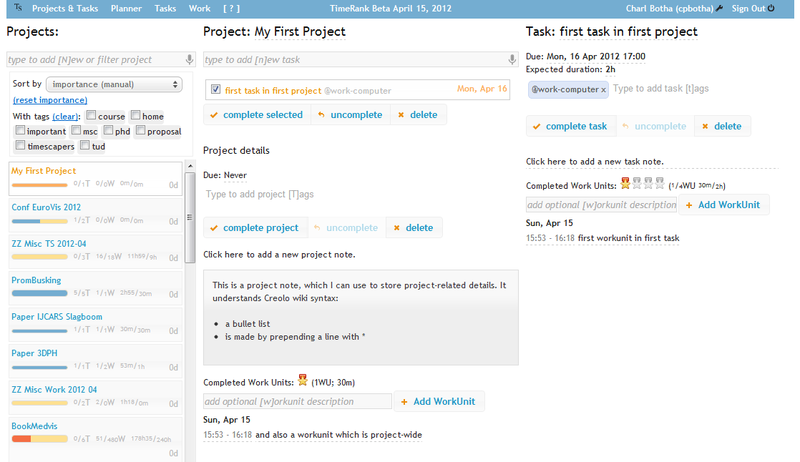 The Projects & Tasks screen consists of three columns. On the left the list of projects, in the centre the list of tasks belonging to the current project with below that the projec details pane, and on the right the details of the currently selected task. Add a new project by typing its name, followed by the enter key, in the new project (and project filtering) input box at the top left. After adding a project, its due date and tags are editable by clicking on the relevant details at the bottom of the center column. You can also add any number of notes to the project, for example to keep track of relevant emails or any other information you might need to complete the project. It’s a good habit to add a note explaining what criteria need to be satisfied for the project to be considered completed. Add a new task by typing its name, followed by the enter key, in the new task input box at the top of the centre column. Edit a task’s details, such as due date, tags and duration, by clicking on the relevant field in the task detail pane on the right. For faster task adding, see Smart task entry below. Just as is the case with a project, you can add notes to each task. Would add a new task with two tags, a due date of December 5 at 18:00 and a duration of 120 minutes. As you’re typing, these details are previewed in the task details pane on the right. When the project sorting is set to “Importance” (the default), you can drag projects up and down, indicating how important they are. Besides helping you to decide upon and focus on the important projects every day, the TimeRank Planner will soon take this into account when calculating a schedule. You can move tasks to a different project by dragging and dropping them. Of course you can also just use the date widget that pops up when selecting any of the date fields to edit. 4w or 4wu 4 work-units, i.e. 2 hours. We love keyboard shortcuts. Please let us know if you’d like more.